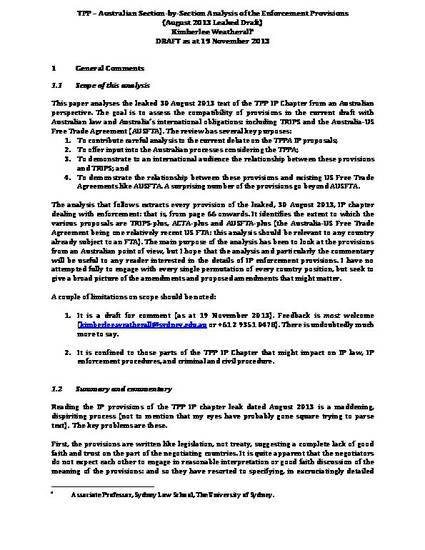 This paper analyses the leaked 30 August 2013 text of the TPP IP Chapter from an Australian perspective, focusing on the enforcement provisions only. The goal is to assess the compatibility of provisions in the current draft with Australian law and Australia’s international obligations: including TRIPS and the Australia-US Free Trade Agreement (AUSFTA). Reading the IP provisions of the TPP IP chapter leak dated August 2013 is a maddening, dispiriting process. The provisions are written like legislation, not treaty, suggesting a complete lack of good faith and trust on the part of the negotiating countries. There are subtle tweaks of language, the phrases included or not included from previous treaties; the subtle re-wordings that might give a treaty provision an entirely different meaning. Working out the scope of a country’s obligations if even half of this text becomes treaty is going to be extremely difficult. A range of big picture questions arise as to the relationship between any TPP IP chapter and other obligations to which countries may be subject, and I’m not at all convinced we know the answers. On a substantive level, much about the language of these provisions has changed since the US proposals dated February 2011. Some more extreme elements of the US proposals have been removed or watered down; some safeguards or qualifications have been inserted that preserve domestic flexibility or require consideration of user interests or civil liberties and fair process. Despite this, the chapter is still radically unbalanced. There are still far too few safeguards for defendants and third parties in the context of IP litigation. And there are many specific proposals with potentially negative impacts on the litigation process and on the balance of IP law.